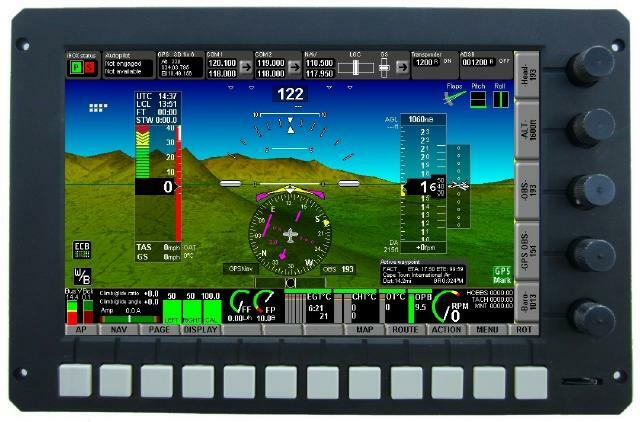 MGL is changing the world of EFIS systems with the introduction of the iEFIS - a distributed; modular system with tap screen display modules and wireless node to connect to any Wifi compatible tablet or PC, and more! As some operations can't be fully replaced by a touch screen, the iEFIS 8.5" Explorer display module adds five “clickable” rotary controls, plus twelve tactile buttons for quick access to often used functions. So iEFIS display modules, combine what's is good with every method to allow a very quick, logical and interactive user interface. As an EFIS hardware platform, the iEFIS breaks the tasks it conducts down into separate modular multi-processor units that all communicate on a reliable CAN bus network (similar to the automotive industry). This results in a robust system in which each device on the network has very specific tasks to handle. This is coupled with intense low power design methods to further maximize overall system application and reliability. The large amount of flexibility built into the base system allows the adaptation of the iEFIS to almost any mission and aircraft. The iEFIS screens can be completely edited by the user using a simple PC program to create any display the user desires. This makes the system absolutely the most customizable EFIS on the market today! Due to low system cost, the iEFIS is equally suited to light aircraft, gliders and rotorcraft, while providing enough flexibility to be utilized by multi-engine aircraft with up to 4 engines monitored, and by turbine aircraft and even spacecraft. The highly modular form of iEFIS systems increases flexibility for special applications; reduces cost; greatly simplifies installation requirements; makes multi-panel systems very affordable; and enables configurations offering very high levels of redundancy (multiple panel/multi sensor/2 x iBOX configurations). The principle guidance during the iEFIS development was “complete, one stop, any function, any aircraft”. The iEFIS Explorer: 8.5” diagonal screen size (800 x 480 pixels - WGA) is Available Now!